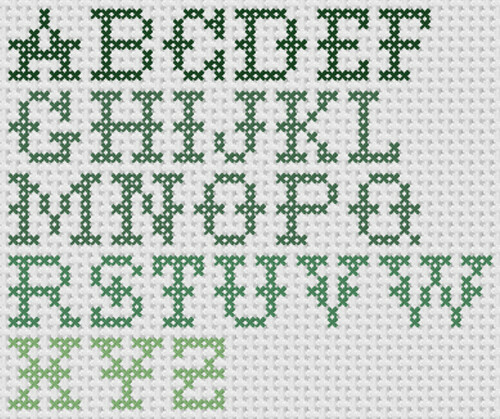 This cross stitch font called Serif Large Alphabets Set is a pattern that would be great to complement other simple cross stitch patterns or other needlepoint projects. Our other cross stitch patterns conveniently include a color key and sheet. If you use one of the free patterns from CrossStitch4Free.com for a project, feel free to contact us and include a picture of your completed project to be included in our web site. Click the Download link below and save it into your computer. All our patterns and charts are in a zipped file format and requires a password to unlock it. The password for this download is “crossstitch4free” without the quotation marks. If you are looking for free cross stitch charts, contact us with your idea and we’ll see if we can help you. Our fonts and alphabet cross stitch patterns is continually growing, so check out our Alphabets collection by clicking on the keyword “alphabets” in the Related Keywords listed below. Mix and match these cross stitch fonts with our other cross stitch patterns to make your stitching project. We appreciate if you can help us spread the word about our free cross stitch patterns by linking to us in your web site, blog, or forums.